Discover the best places to enjoy afternoon tea in London! Henry James once wrote, “there are few hours in life more agreeable than the hour dedicated to the ceremony known as afternoon tea.” Londoners would agree with this sentiment. Afternoon tea isn’t just a hot beverage; it’s an occasion steeped in centuries of British tradition. 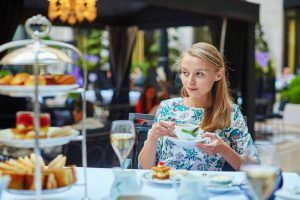 While Afternoon Tea might not be a commonality in present-day London, tourists and locals frequent tea rooms after a day of sightseeing or shopping. Are you planning to explore London? Discover the best places to enjoy afternoon tea with your fellow travelers! Also known as “London’s most famous hotel,” The Savoy delivers an elegant yet traditional Afternoon Tea experience. Situated in Covent Garden, guests can overlook the Thames to the south, and enjoy a view of The Strand from the north side. The service is lively, the linens are crisp, and diners can enjoy their fair share of irresistible finger foods and several blends of tea. Afternoon Tea at The Ritz is a luxurious, gilded dining experience. Served in the mirrored Palm Court salon, tea-takers select from a large list of local and exotic blends. A vocalist croons enchanting melodies into the high ceilings, while the wait staff presents a variety of treats accompanied by jam and clotted cream. Fans of Afternoon Tea can thank Anna Russell, the Duchess of Bedford for introducing the ceremony to London in the 1840s. A dainty woman, she would become so hungry by early afternoon that she would request cakes, bread, and a hot pot of tea in her dressing quarters. History buffs can now enjoy an interactive Afternoon Tea experience with The Duchess herself at Mr. Fogg’s Tipsy Tea. Afternoon Tea at the Blakes Hotel in Chelsea is best enjoyed outside in the botanical garden. The menu is lighter than most, offering only tea and petite eclairs of varying color. Guests can enjoy a view of the eclectic courtyard, or book a table inside of the gold-domed birdcage. AESU offers several trips to London and the UK, including Cosmopolitan, Euro Spree, Explorer, Euro Focus, and our most popular tour, Great Escape. Explore England and enjoy a traditional Afternoon Tea experience. This entry was posted on Wednesday, January 31st, 2018	at 11:48 am	. You can follow any responses to this entry through the RSS 2.0	feed. Both comments and pings are currently closed.